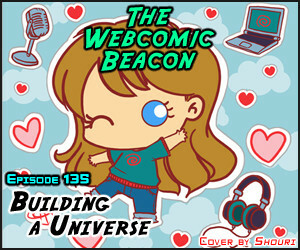 Michael Dellheim (Prepare to Die) and Adam Smithee (The Apple of Discord) join Fes and Mark to discuss building the universe for your comic. Tangents a plenty, and there’s certainly more of the subject to look into in the future. But for now come have some fun with us! Notes: The break song was Parallel Universe by Draggin’ Suzy, Yet Another Fantasy Gamer Comic, Goblins, Apple Valley, Blambot, Erant Story, DMFA, Dredsen Codak, Hero Academy, Milestones: Scientific Madness (200), Prepare to Die (1000). 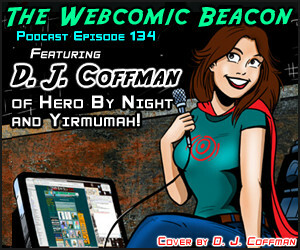 D. J. Coffman (Hero By Night) joins Fes, Tanya, and Mark to talk about his comic Hero By Night and working with Platinum Studios, as well as his projects since, including Yirmumah and Will Draw Anything. We also go into his Cash for Cartoonists eBook and coaching project. In the 3rd segment, Fes gets frustrated with… I mean we discuss coloring and color theory and printing. Gordon McAlpin (Multiplex) joins Fes, Tanya, and Mark to discuss movi– talk about printing a comic in a large scale with offset printing. Lots of great information on getting a book printed… we also talk about movies. 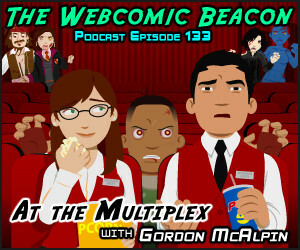 We talk much on 3D movies and also of Scott Pilgrim vs. The World. Notes: The break song was At The Movies by Greg Annussek, Small Press United, Jostens, Team Blade, HijiNKS ENSUE, D.J. Coffman, Milestones: Demon Eater (400), School Spirit (900).